How many Wind Farms are there in Ireland? I want to visit a wind farm, where is the nearest one to me? What is the current installed wind capacity of Ireland? What can I do to help wind energy in Ireland? What is a Wind Farm comprised of? With many wind farms in operation in Ireland it is highly likely that there is a wind farm located quite close to your community, either in or adjacent to your own county. 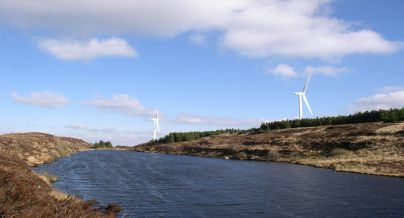 For a full list of wind farms in Ireland, see our Wind Farms by County page, here. The current* grid connected and operational installed wind capacity on the island of Ireland is 3025 Megawatts (MW). It is estimated that 1MW of wind capacity can provide enough electricity to supply approximately 650 homes. Based on this figure, an installed capacity of 3025MW can provide enough electricity to power over 1.97 million homes. There are many ways to positively support both wind energy as a renewable resource, and the Irish wind industry. One of the simplest ways is to become a member of the IWEA and lend your support to the organisation. Your contribution will help the IWEA push and promote the wind agenda in Ireland. If your business or home is currently supplied by non-renewable energy, investigate the possibility of switching to a renewable wind energy provider. This has the effect of supporting current wind energy suppliers and encourages both the expansion of current wind enterprises and entry of new ones. One of the most helpful things you can do is to help win the debate on wind energy. Get involved and respond to wind energy debates in local and national papers. Participate in radio phone-in programmes and wherever else the opportunity arises. Your contribution is extremely valuable and will help promote positive attitudes and perceptions about wind energy. A wind farm is comprised of a group of wind turbines located relatively in the same area which are then interconnected with a medium voltage power collection system together with a communications network. A substation is also located on site. At the substation, this medium-voltage electrical current is increased in voltage with a transformer for connection to the higher voltage transmission system.